Call To Schedule Your Root Canal! The teeth appear solid when we touch them, and of course they are; however when we look at tooth structure under an electron microscope, we see the structure consists of hollow tubules. These microscopic tubules allow interstitial fluid to flow via arterial pressure within the tooth nerve and blood vessel canal out through these tubules into the space between the tooth and the bone. The technology to perform predictable root canal therapy has been used in dentistry for only about 100 years. Once a root canal has been performed, the patient is pain free, and the tooth can be kept functioning and pain-free for a number of years, thus avoiding an extraction even though the tooth was severely infected. 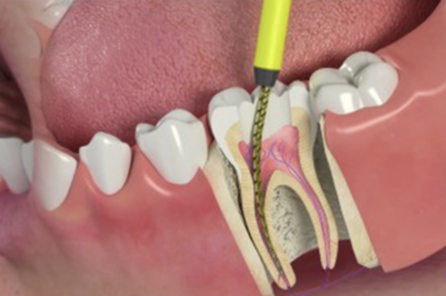 There are several symptoms that lead dentists to consider the need for root-canal therapy. Often, the first symptom is sensitivity to cold; however this single symptom is rarely enough to cause a dentist to proceed with root-canal treatment. Sensitivity to sugars can also lead to considering root-canal treatment; but this type of symptom can just as likely be solved by placing or replacing a dental filling. If, however, heat sensitivity is present, the need for a root canal is far more likely, although it can be due to other conditions that do not necessarily lead to root-canal treatment. If heat sensitivity is accompanied by a painful pulse throbbing in and around the tooth, it can mean that the nerve has become necrotic, and the heat is causing the gasses that are associated with necrosis to expand and release pressure from within the tooth out in to the supporting structures that surround the tooth. This gas pressure causes intense pain which often pulses in conjunction with the pulse from the beating heart. ​The pain from heat can be so severe that prescription pain killers simply don’t do the job! Often the only thing that helps until you can get to the dentist/endodontist is to take a piece of chipped ice about the size of the tip of your pointing finger and place the ice under your lip at the point where you suppose the tooth root tip ends. The theory here is that you constrict the gasses in the necrotic tooth canal thus stopping the expansion of gasses out of the tooth into the surrounding area. It is my opinion that the most important factor in preserving teeth that are in need of root canal therapy, is the diligent removal of the infected, necrotic nerve tissue with as little reduction of the actual tooth mass as possible. By that I mean the dentist should not over instrument the canal space by removing sound tooth structure within the tooth canal space. This is important because when the tooth loses the nerve and blood vessels inside, it also loses the flow of nutrients and interstitial fluid that keep a vital tooth flexible and vital. As time goes by, the root canaled tooth becomes more and more rigid and brittle. Often this results in a fracture during chewing pressure; and results in the loss of the tooth. So, leaving as much tooth structure within the tooth during the root canal process is vital to retaining as much strength as possible for that time when the tooth becomes brittle and less able to withstand chewing pressure. Performing minimally invasive, tooth structure preserving techniques are in my opinion the factor that sets dentists apart from one another where root canal treatments are concerned. Molars are the most common teeth which end up needing root canals, since they are in the back of the mouth and are the hardest to maintain bacteria free by the patient. ​Each molar has 3 nerves running through it, and therefore a root canal on a molar actually involves cleaning out and filling 3 canals in order to save the tooth. When you are a good candidate for a root canal at our office, the typical cost is $1,100 for a molar (3 canals), $1,000 for a pre-molar (2 canals), and $900 for an anterior tooth (1 canal). Depending on the reason why the nerve is infected, you might also need an extensive restoration on the tooth such as an onlay or a crown. This would also be done in our office once the root canal is completed, and the cost for the restoration would be quoted to you at your initial exam (typically around $1,000 if the tooth does need a crown or an onlay). For patients who have PPO insurance, we are typically in-network with your company, and in most cases root canals are covered at 80%, and buildups and crowns are covered at 50%.